A couple Sundays ago I had to finish two articles that were due Monday morning. 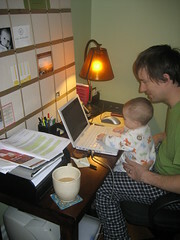 While I showered, Sophie insisted she help me write my lede. As you can see, there was a lot of baby talk, a language Andy and I still aren’t quite fluent in, but there was one English word, a name—”Drasnin.” When I first saw this, I was dumbfounded. “Drasnin” is Dr. Drasnin, Sophie’s pediatrician. How did she manage to type that? And with a capital “D” to boot! 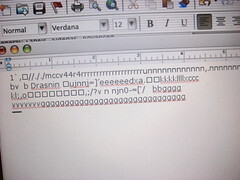 Then, Andy asked me, “What’s the last thing you copied and pasted?” It was “Drasnin.” So in her typing, she must have hit “apple” + “v.” That or she really is a genius. This entry was written by kara, posted on January 28, 2009 at 9:21 pm, filed under Uncategorized. Bookmark the permalink. Follow any comments here with the RSS feed for this post. Post a comment or leave a trackback: Trackback URL.